What's New at Buddhist Artwork; Buy Buddha Statues Online !! Our product portfolio is constantly expanding. Sign up to our free monthly newsletter to stay automatically updated. GUARANTEE. We believe fully in the quality of our products and offer a 15-day money-back guarantee. For more details, please see Store Help page. Koyasu Jizo (Easy Childbirth Jizo). Details here. Shaka (Historical Buddha). Details here. 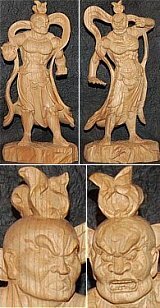 Added four Fudo Myo-o statues. Details here. Added two Dainichi Statues. Details here. Please help the people of Japan by making a donation, no matter how small. Click here for a wide variety of trustworthy sites that you can donate to. Special clearance items, 33% to 70% off. PLEASE ORDER BY DEC. 14 TO ENSURE DELIVERY BY CHRISTMAS. Orders placed after Dec. 14 won't be shipped until Jan. 11. New American mail regulations significantly slow down international package delivery for any item weighing more than one pound (463 grams). Added two Kujaku Myo-o statues. Details Here. Added three CALLIGRAPHY products. Details Here. Added three Bishamonten statues. Details here. Added another set of the Seven Lucky Gods. Details here. Special Gift Campaign to Commemorate Buddha's Birthday. During April & May, receive a free prayer-bead bracelet ($15 retail) with your purchase. Details here. Added statues of the Seven Lucky Gods. Added new work by calligrapher-painter Afaq Saleem. Added statues of monks Kobo Daishi and Nichiren. All new ceramic incense burner with effigy of the Historical Buddha inside. Significant reduction in prices, plus new Price Selector to help you find bargains and products in your desired price range.